I love buying a product with more than one use… especially when its more on the dearer side! 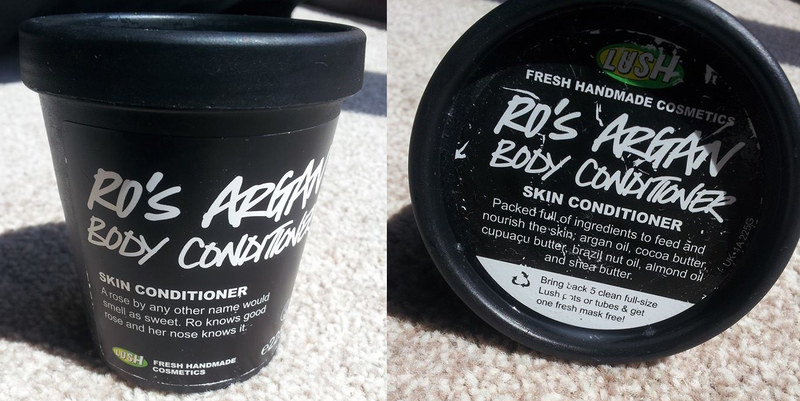 Ro’s Argan Body Conditioner by LUSH Cosmetics is a product more marketed towards bath and shower but its luxurious ingredients makes it more versatile. Everyone loves argan oil, its nourishing and deep conditioning properties leaves any surface feeling plumped and hydrated. So how versatile is Ro’s Argan? Most products containing argan oil can be used and applied onto more than one area of the body, but what makes Ro’s Argan extra special is its additional ingredients; shea butter, rose oil and almond oil. You can, as recommended, take this product into the bath and shower and use it as a conditioner for the body (which will add suppleness and reduce ageing) but I’ve come up with my own nifty uses which will add additional improvements to your beauty regimes! Use 1-The Ultimate Lazy Fix: (as recommended) use in the bath or shower as a body conditioner to add suppleness to the skin. Additionally this is good to anyone who is a little bit lazy and avoids applying body moisturiser after showering/bathing. Use 2- The Deep Hair Conditioning Treatment- Oh my goodness, when you leave this product in your hair for 20 minutes before shampooing and conditioning your hair will feel ever so hydrated! Using this product on and off for two months has strengthened by brittle ends, so give it a go. Use 3- The Hair Conditioner- If you have thick hair and struggle to find a conditioner that will actually work, this product is definitely for you. All you would need to do is add the slightest bit to you ends and then rinse off well. But please note, too much will make your hair look greasy! Use 4- The Sunburn Fix- This for me is a god send on sun burn (especially in the shower!). Apply it as instructed in use 1, where the rose oil will get to work and consequently soothe and comfort the burn. Use 5- The Rose Scented Body Lotion- Maybe use Ro’s Argan as a body lotion to smell like a bouquet of roses this summer? Use 6- Dry, Eczema and Rosacea Skin- Applying this product as instructed in use 1 and 5 will help treat and conquer skin problems. This product is extremely natural containing shea butter, almond oil and rose oil which will soothe any irritation. Use 7- The Ultimate Foot Spa- This can be done in two ways, first, use Ro’s Argan in a foot bath as instructed in use 1, or secondly apply as instructed in use 6. Under use 6, I would smother Ro’s Argan all over my feet and then put bed socks on for the duration of the night. Rinse in the morning and you will be left with soft tootsies! (or should I say, flip flop friendly feet!). So what’s your most versatile product?